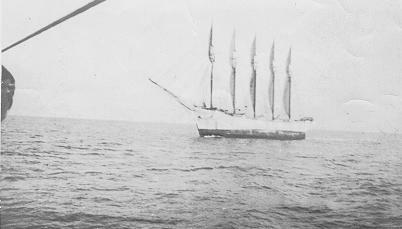 On the morning of January 31, 1921 the five-masted schooner Carrol A. Deering was spotted aground on Diamond Shoals off the coast of North Carolina. Coast Guardsmen from the Cape Hatteras Life-Saving Station rowed out to the ship only to find not a soul aboard and no sign of what might have happened to the crew. Built in Bath, Maine, the Deering was designed to ply the trading lanes between the eastern seaboard of the US and South America. On her final, ill-fated voyage in January 1921, the ship sailed from Rio de Janeiro and, after a brief stopover in Barbados, continued her voyage north. The ship was last seen manned by the Cape Lookout lightship on January 28, 1921 and only 3 days later she was found run aground nearly 100 miles northeast on Diamond Shoals. When the Coast Guard was finally able to board the ship on February 4, the Coasties found the ship deserted, the crew’s belongings, navigational equipment and lifeboats gone, and the ship’s galley appearing as if a meal was in the process of being prepared. Despite numerous inquiries at various levels and branches of governments, the mystery of the crew’s disappearance was never solved. The most likely explanation is that the crew mutinied as mutinous comments had been overheard by some observers when the ship was last in port. Other explanations offered over the last 90 years have included piracy, a Communist plot, the Bermuda Triangle and even that the crew was the victim of some paranormal phenomenon. The ship herself survived her crew by only a month as, unable to be re-floated, she was dynamited to prevent her from becoming a hazard to navigation.